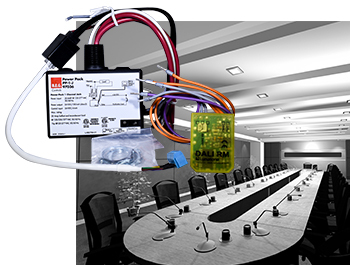 The RATIO Relay Control Kit adds an addressable 20A relay control gear solution to RATIO architectural dimming and scene control. The RATIO RCK can be used for switching control of non-dimming lighting loads, small motors, and receptacle plug loads. The relay kit is wired for normally open (N.O.) operation. The RATIO RCK can be assigned to work with a group so it can be controlled by a sensor or push button, or be part of a scene recalled by push button or the smartphone app. The state is either open or closed. The RATIO RCK is field installed, and easily fits inside standard 4x4 junction boxes or other enclosures. Two junction boxes or separate enclosure compartments are required; one for the line voltage terminations, and one for the low voltage terminations. The wire leads on the low voltage relay module include ferrule connectors, so terminations can be made quickly and easily.